Several years ago I came up with an idea for a potential gag for The New Era. 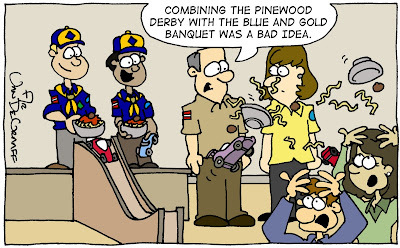 What if, I wondered, the Cub Scout Pinewood Derby was combined with the Blue and Gold Banquet? Hilarity would ensue--that's what would happen. 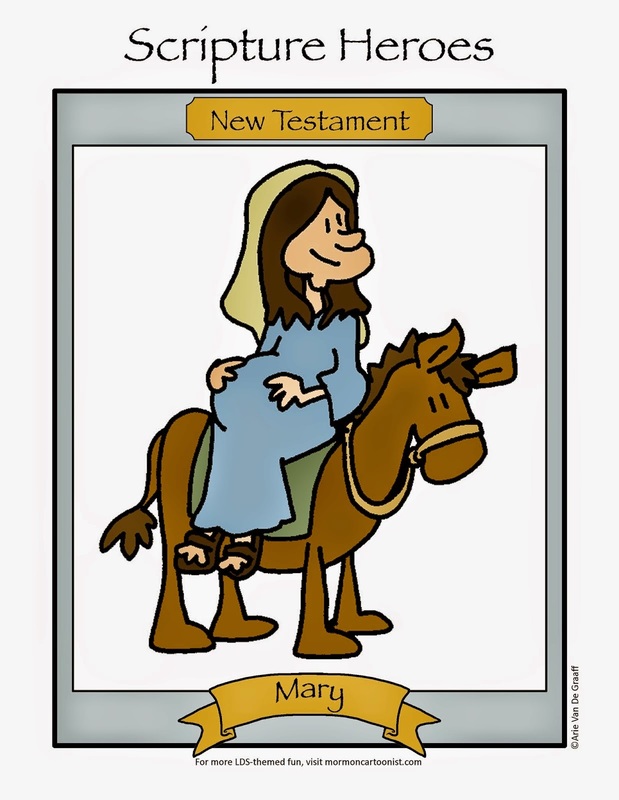 So I drew a gag and submitted it. I was disappointed when the editors passed on the gag, but I wasn't too upset because when the time came to submit more ideas several months later, I had another Pinewood Derby gag. Well, when the magazine passed on my second gag, I had found a cause. I was determined to see a Pinewood Derby gag in The New Era. For the next couple of years, every time I submitted a series of gags to The New Era, I made sure to include one Pinewood Derby gag. And every time the magazine passed on anything having to do with wooden cars carved by the fathers of primary-aged children. Eventually, I abandoned my dream and moved on to other stuff, but I still carry a soft spot for the following gag. How about the ark sinking while Noah's kids carve pine wood derby cars from pieces of wood torn from the hull? Caption: How we know the pine wood derby was not invented until after the flood. Or pioneer pinewood derby with little handcarts rolling down the track? Or Relief Society pinewood derby with casseroles sliding down tracks of quilted doilies? I think the Pencil Pinewood Derby car your dad made is still the favorite derby car I have seen. I always enjoyed this comic also. Someday, when you become a scout leader you can make this comic a reality. Did they spell your name wrong on purpose on the books? I find this hilarious! Andy and I are Cub Masters right now and having our blue & gold tonight -- pinewood in 2 months and YES WE SHOULD HAVE COMBINED!!! hilarious!!! great work Arie. tell Mindy hi .... we need to get together sometime soon now that we are back.